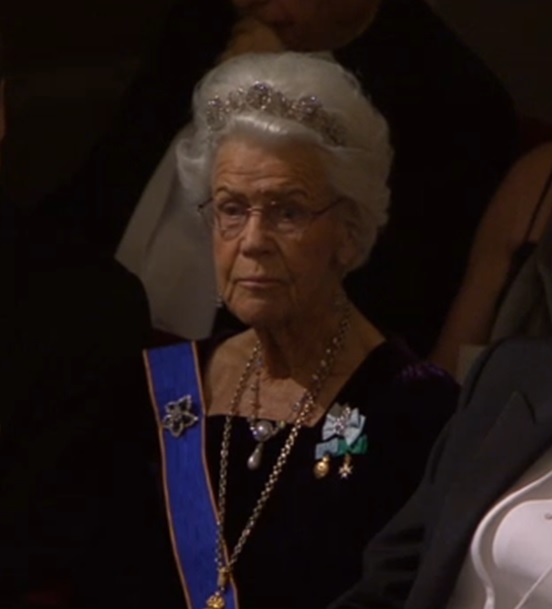 The Swedish royal family said goodbye to a friend and longtime advisor when Countess Alice Trolle-Wachtmeister died on Monday at the age of 91. Countess Alice served the Swedish royal court for nearly 40 years, serving as First Lady of the Court from 1978 to 1993 and then afterwards serving as Mistress of the Robes to Queen Silvia until illness forced her to retire in 2015 at the age of 89. She was a close friend to Queen Silvia, having helped her adjust to life in Sweden after her marriage, and served as a mentor to the younger family members. So essential was Countess Alice to the Swedish royal family and court, the King refused her resignation several times. 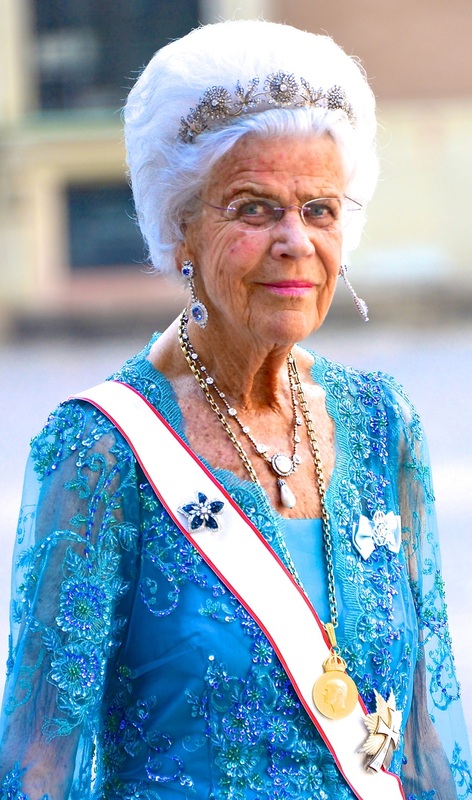 Countess Alice Trolle-Wachtmeister may be familiar to you if you follow the Swedish royal family closely; the delicate diamond floral tiara which was her constant companion at gala events may also be familiar to you, if you’ve ever camped out with us on tiara watch during Swedish royal events. A closer look seemed an appropriate tribute for our weekly tiara feature. Her diamond floral tiara features a central large flower with 16 petals and a single diamond center. To the sides sit two slightly smaller flowers, each also displaying 16 petals and a single diamond center. The floral buttons are surrounded by diamond foliage. Some have noted the similarity between this tiara and the Strathmore Rose Tiara in the British royal collection, both jewels nestling floral buttons into a diamond leaf pattern. Perhaps an even better comparison can be made to Japan’s Imperial Chrysanthemum Tiara. The 16-petal chrysanthemum imperial seal is repeated here, making Countess Alice’s tiara something of a petite version of the tiara worn by Japanese empresses. The tiara may be a family heirloom, though (to my knowledge) its precise history is unconfirmed. Alice herself was a member of the Tornérhielm family and she married within the Swedish nobility, to Count Hans-Gabriel Trolle-Wachtmeister in 1949. As a member of the Swedish royal court, Countess Alice had ample occasions to use this tiara, and use it she did: at Nobel Prize ceremonies and banquets, royal weddings, state banquets, and more. She wore it with evening gowns and with her court dress uniform, a distinctive navy velvet dress with puffed sleeves featuring a white ribbon lattice. (The same uniform can be spotted today on Queen Silvia’s ladies-in-waiting and on the head of Crown Princess Victoria’s household. These ladies will also wear tiaras if they have them for gala events.) Her diamond floral tiara was the perfect accessory for the position and the perfect fit for Countess Alice, whose presence will be much missed. Where does this rate on your floral favorites list?